Originally a pure jazz festival, it opened up in the 1970s and today presents artists of nearly every imaginable music style. Jazz remains an important part of the festival. Part of the festival's expansion was due to coproduction by Quincy Jones who brought many international artists in the early 1990s. Today's festival lasts about two weeks and attracts an audience of more than 200,000 people. In the 1970s, the festival began broadening its scope, including blues, soul, and rock artists, for instance Marianne Faithfull, Led Zeppelin, Pink Floyd, Frank Zappa, Deep Purple, Canned Heat and many others. Towards the end of the decade, the festival expanded even more, including music from all continents (with an emphasis on Brazilian music) and lasting a full three weeks. Santana came to Montreux for the first time in 1970; Van Morrison played in 1974 and 1980. Other artists included B.B. King, Gary Moore, Weather Report, Don Ellis, Crossfire, Buddy Guy, Camarón de la Isla, Soft Machine, Chuck Berry, George Clinton and Parliament-Funkadelic, Eric Clapton, Luther Allison, Bo Diddley, Stan Getz, Airto Moreira, Joe Henderson, Dizzy Gillespie, Oscar Peterson, Ney Matogrosso, Charles Mingus, Etta James, Sonny Rollins, Son House, Count Basie, Chick Corea, Herbie Hancock, Gilberto Gil, Ray Charles, James Booker, Hermeto Pascoal, Mahavishnu Orchestra, Rory Gallagher, Stevie Ray Vaughan, Elis Regina, Les McCann, Eddie Harris, Pasadena Roof Orchestra, New Order, Jaco Pastorius, Ringo Starr & His All-Starr Band, Toto, Zucchero Fornaciari, André Geraissati, Korni Grupa, Jan Akkerman, Joe Satriani, Status Quo, and many more. The initiator and, until his tragic death in 2013, the head organizer, Claude Nobs, managed to bring an array of artists to Montreux, both established ones and newcomers. Following Claude's death, the organisation of the festival was handed over to Mathieu Jaton. Main partners of the Festival are Parmigiani Fleurier, Manor, Heineken, Vaudoise Assurances and UBS. The festival was originally held at the original Montreux Casino, which burned down in December 1971 during Frank Zappa's performance (as referenced in "Smoke on the Water" by Deep Purple). The festival was held then in other auditoriums in Montreux, until it could return to the rebuilt new Casino in 1975. The festival continued to grow, and in 1993, it moved to the larger Montreux Convention Centre. From 1995 through 2008, it occupied both the convention centre and the casino. Beginning with the 41st MJF in 2007, nightly performances of headliners were again moved mainly to the Montreux Musique & Convention Centre (though the Casino still hosts the odd one-off shows), owing mainly to logistics: the Casino is approximately 1 kilometre (1,100 yd) from the Convention Centre, making it difficult for crew, artists and technical personnel (as well as fans) to travel easily through crowded streets from one venue to the other. (This is exacerbated by the presence of a large number of streetside vendors and artisans – as well as strolling crowds of tourists – on the lakefront walk that connects the venues.) As of 2007, the Convention Centre hosts two main stages, Auditorium Stravinski (capacity 3,500) and Miles Davis Hall (capacity 1,800), as well as the smaller Montreux Jazz Cafe, and several smaller open-air stages around the Centre. Additional themed shows (Bahia, Blues, etc.) are held on boats cruising the lake and train cars traveling the region, and various workshops and competitions are held at the nearby Montreux Palais and Le Petit Palais. The festival changed in the 1980s: it grew dramatically and included an even wider variety of music styles. Jazz remained important, as did Brazilian music, but more rock and pop artists were also invited. Miles Davis came to Montreux several times, British hard rock band Deep Purple were invited as headliners eight times, and Status Quo have headlined the festival twice. Other notable artists at Montreux were Sandra Max Roach, James Brown, George Clinton and Parliament-Funkadelic, Wynton Marsalis, Art Blakey, John McLaughlin, Stevie Ray Vaughan, Wayne Shorter, Al Di Meola, Elvis Costello, Jimmy Cliff, Steel Pulse, Mike Oldfield, Brian May, Marvin Gaye, Rory Gallagher, Leonard Cohen, Nina Hagen, Eric Clapton, Queen, Phil Collins, Joe Cocker, Los Lobos, The Manhattan Transfer, Tracy Chapman, and Van Morrison again. The expansion that began in the 1980s has continued since then – Montreux transformed from a jazz festival into a world music festival. Quincy Jones co-produced the festival from 1991 to 1993. By 1993, the festival had outgrown the Casino and moved to the larger Convention Centre. The number of visitors rose from 75,000 in 1980 to 120,000 in 1994, and an "Off-festival" developed on the lakeshore promenades and in the cafés of Montreux. Many "regulars" returned, but many new artists also appeared on stage: Sting, Bob Dylan, Fats Domino, Deep Purple, Al Jarreau, Chaka Khan, Johnny Cash, Cheap Trick, Cheb Mami, Youssou N'Dour, Marianne Faithfull, Ice-T, Jazzmatazz, ZZ Top, Simply Red, Marisa Monte, George Benson, Jazzkantine, Alanis Morissette, David Bowie, Paul Simon. In 1999, the festival saw more than 220,000 visitors. The festival has also played host to some well-known and talented student groups, including big bands and vocal ensembles. Young, talented musicians are encouraged to take part in several competitions. Three international competitions are organised by the Montreux Jazz Artists Foundation every year: Solo Piano, Guitar, and Voice. Each competition has its own jury composed of professionals and chaired by a world-renowned musician (in 2008: Fazıl Say for the Piano Solo, Lee Ritenour for the Guitar, Patti Austin for the Voice competition). In addition, until 2016, a local competition, the Tremplin Lémanique, was aimed at jazz bands that are based in one of the regions of the Léman lake: the French departments of Ain and Haute Savoie and the Swiss cantons of Geneva, Vaud and Valais. Over 1300 artists have performed at the Festival from 1967 to 2016, with the most appearances by Herbie Hancock (27 times) and B.B. King (21 times). A number of performances have been released on DVD and/or Blu-ray by Eagle Rock Entertainment. 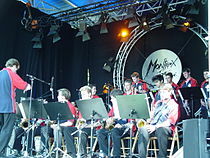 Australian Youth All Star Big Band performing at the Montreux Jazz Festival in 2004. Various Artists: Montreux Summit Volumes 1&2, 1977 – Two double album sets consisting of an all-star concert with various Columbia label artists including Bob James, Stan Getz, Dexter Gordon, Billy Cobham, George Duke, Benny Golson, Eric Gale, Hubert Laws, Maynard Ferguson and many others. ^ Mutter, Zoe (6 July 2015). "Meyer Sound LEOPARD takes to the Montreux jazz stages". AV Magazine. Metropolis Business Media. Retrieved 16 May 2017. ^ "Géo Voumard, a Founder of the Montreux Jazz Festival, Dies at 87". New York Times. Agence France-Presse. 8 August 2008. Retrieved 11 September 2008. ^ "Claude Nobs". Montreux Jazz Festival. Archived from the original on 2 November 2010. Retrieved 16 May 2017. ^ "Montreux Jazz Festival". Montreux Jazz Festival. Retrieved 28 January 2018. ^ "Evolution of genres in the Montreux Jazz Festival". 29 July 2016. Retrieved 29 July 2016. ^ "Montreux Jazz Artists Foundation". Retrieved 24 October 2016. ^ "Eagle Rock". Eagle-rock.com. Retrieved 16 February 2014. Wikimedia Commons has media related to Montreux Jazz Festival.